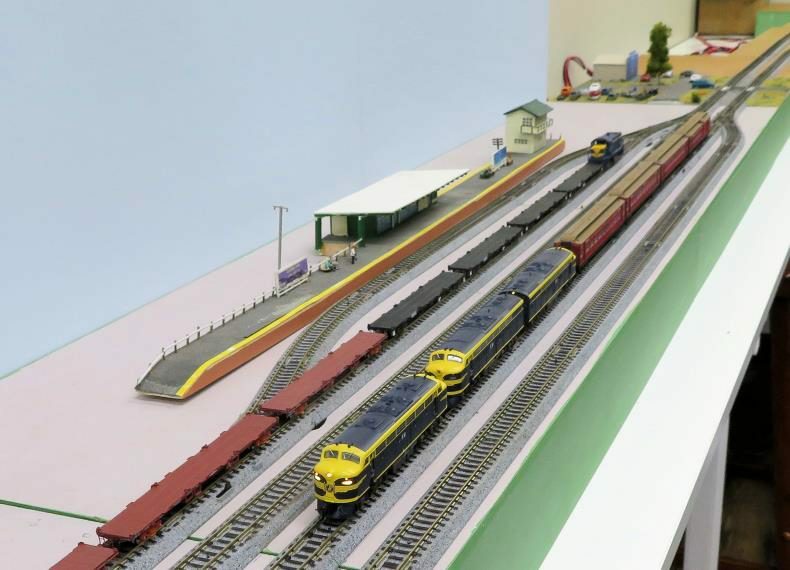 B class and two S classes lead a train of E cars on a layout made of T-Trak modules. 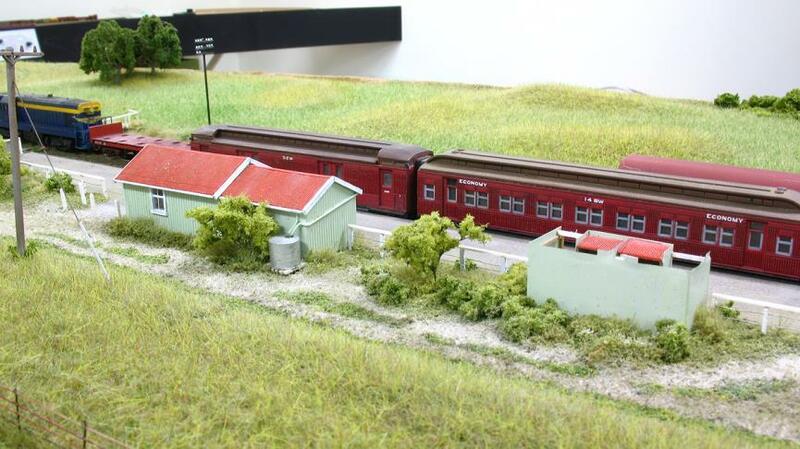 End end of the station yard at 'Murtamba'. 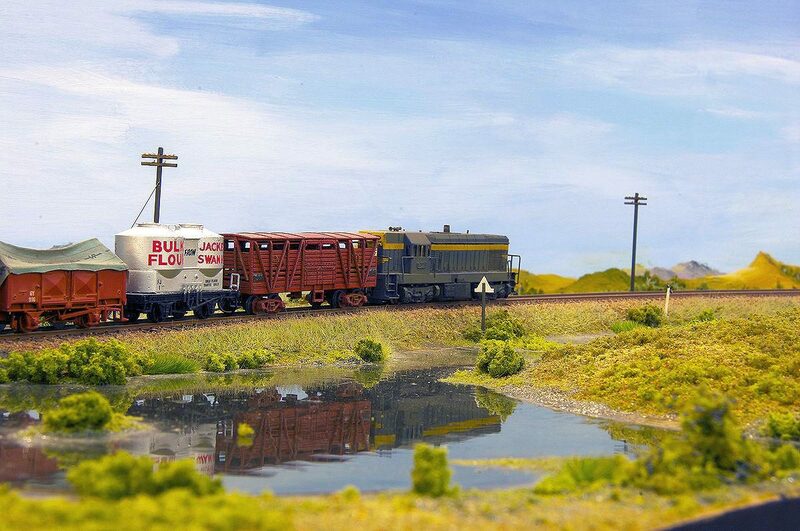 On 'East Blaney' a herd of cattle are being driven to the small stockyard across the bridge, while K172 approaches Alvie with a short goods. 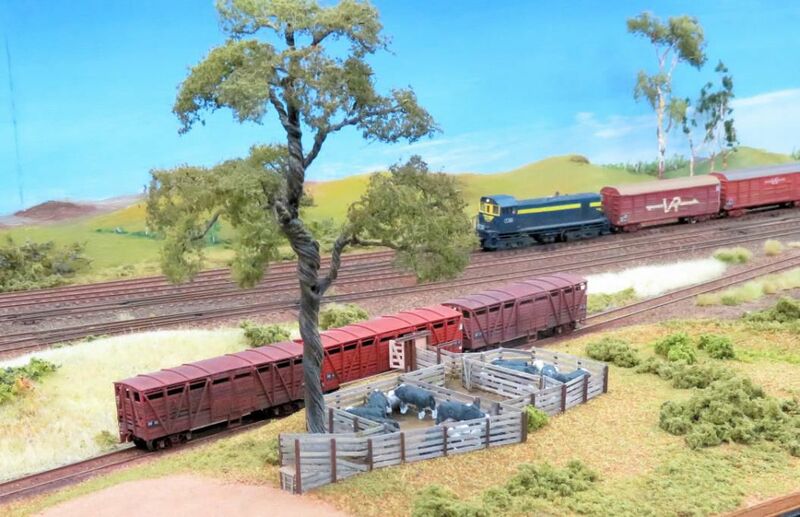 On 'Murtamba' T383 with a short goods crosses a gully on the branchline, as S315 leads a grain train on the mainline behind. 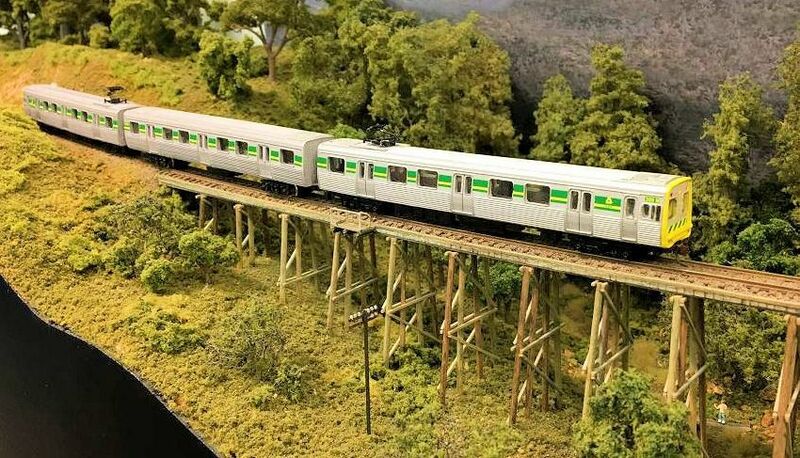 VLocity with all lights blazing at Club Terrace on 'Cann River'. 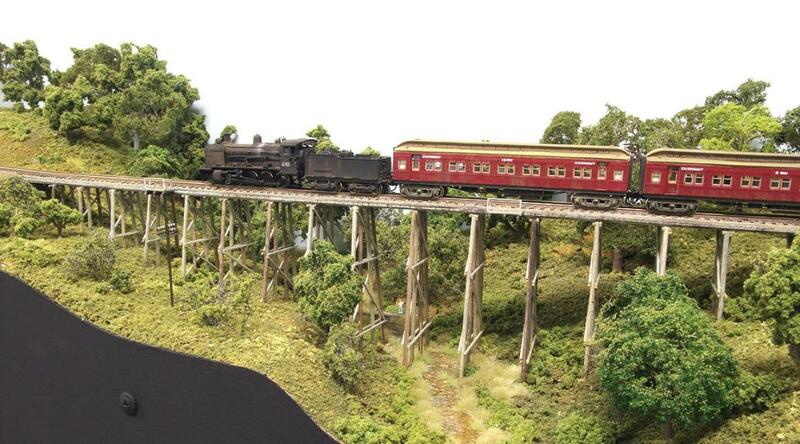 NSW locomotives 4477-4846-4485 by Gopher Models’ cross a timber pile bridge on 'Cann River'. 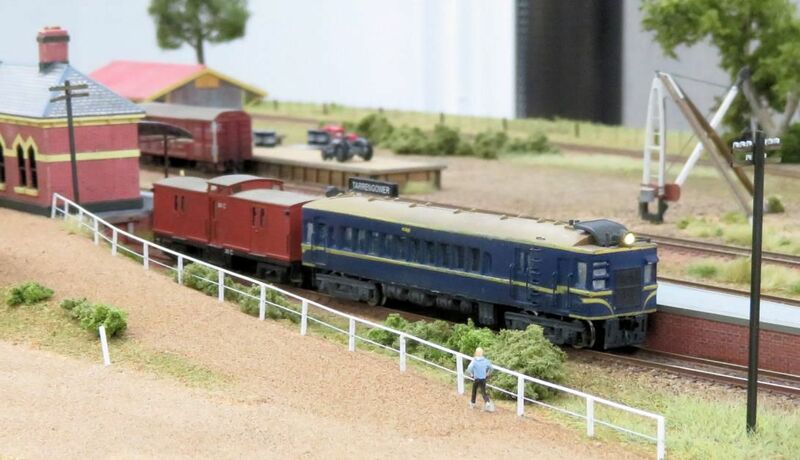 Modern-era Pacifc National and Australian National freight trains pass a Walker railcar in the refuge siding on 'Belair'. 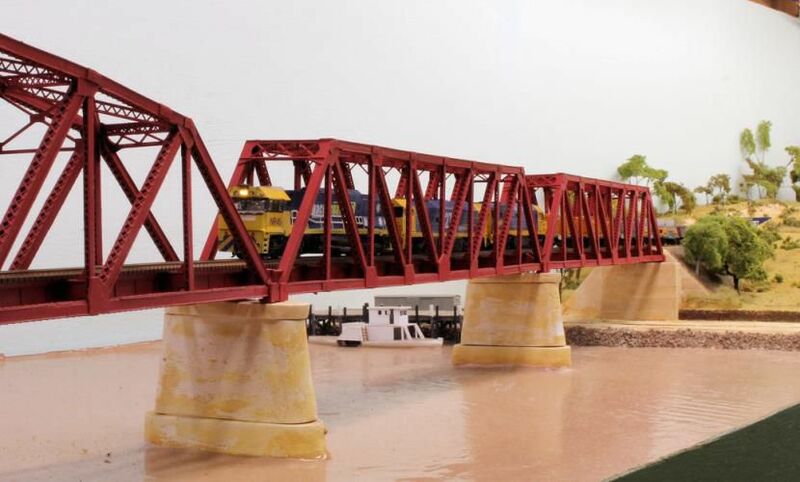 NR class locomotives lead a modern Pacific National freight across the Murray River on 'Belair'. 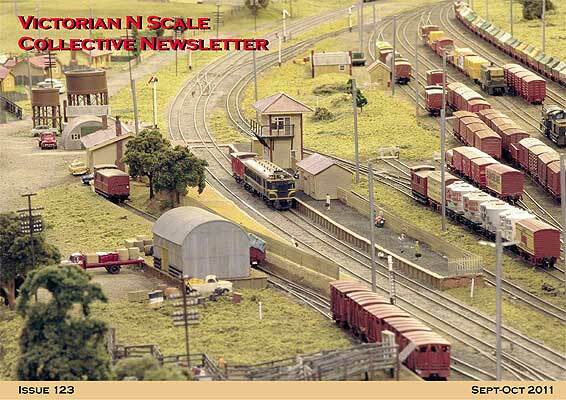 A busy scene in Cann River yard on 'Cann River'. 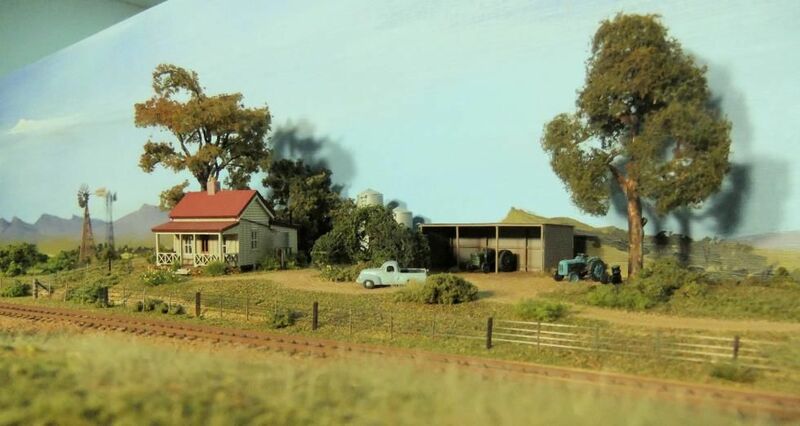 Black Flat station area, looking towards Melbourne, on the late Jim Blaney’s ground breaking layout 'Victorian Railways in the 50s'. 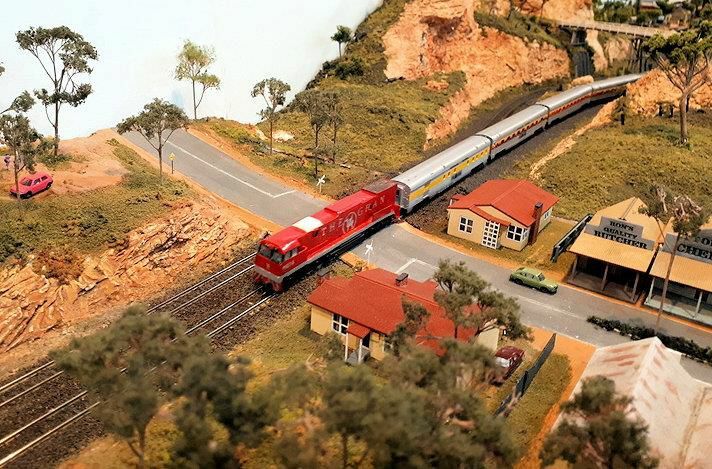 'Flat top' T class locomotive T333 leads a pair of BV carriages and a C van at Noorinbee station on "Cann River". 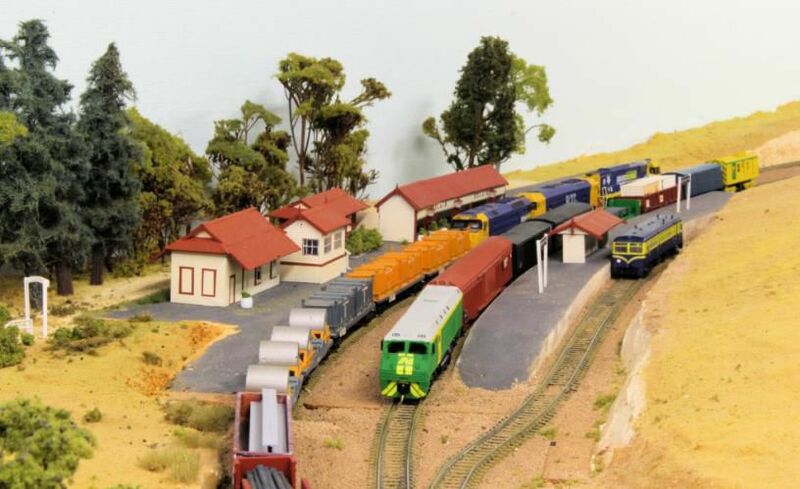 High Camp yard on the Heathcote branch sees an unusual visitor in the shape of AN 830 class no. 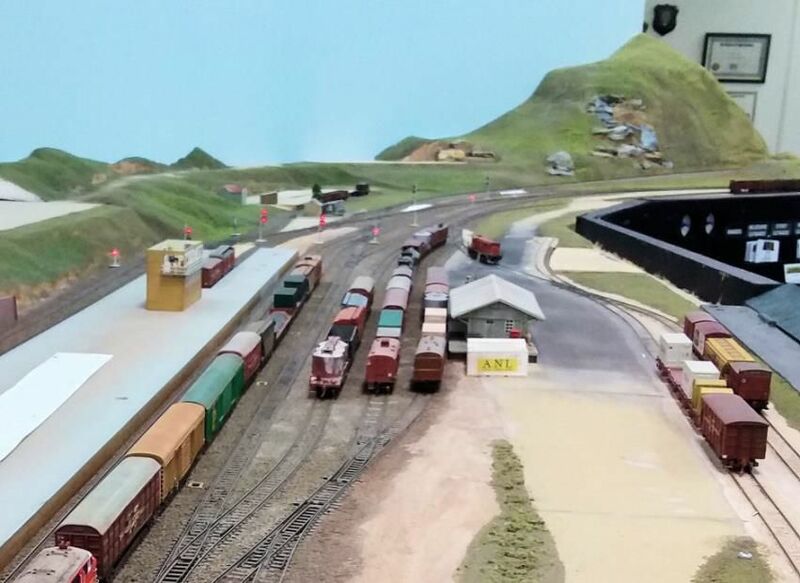 844 arriving with a mixed goods. 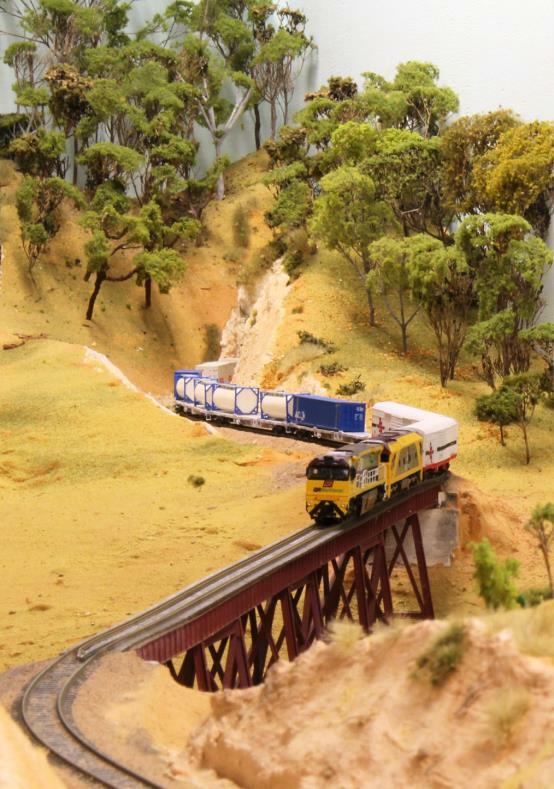 The Up evening pass pauses at Sutherland’s Flat as it crosses a Down goods on "Emu Creek". 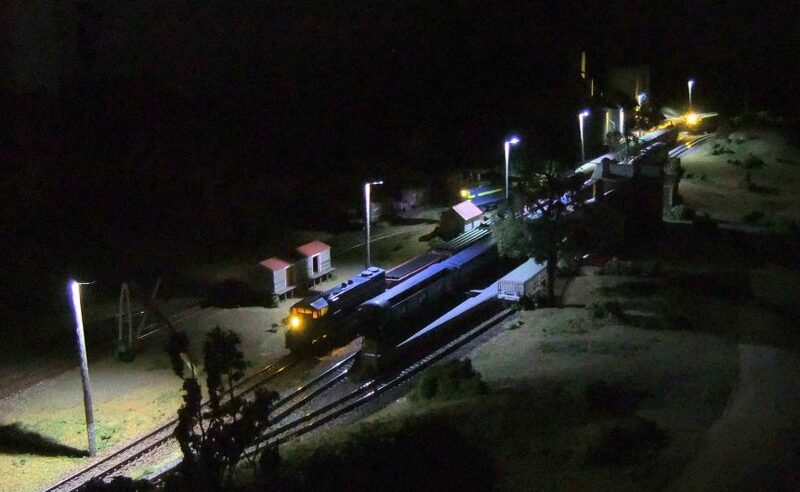 Six yard lights fitted with nano-LEDs illuminate the scene. 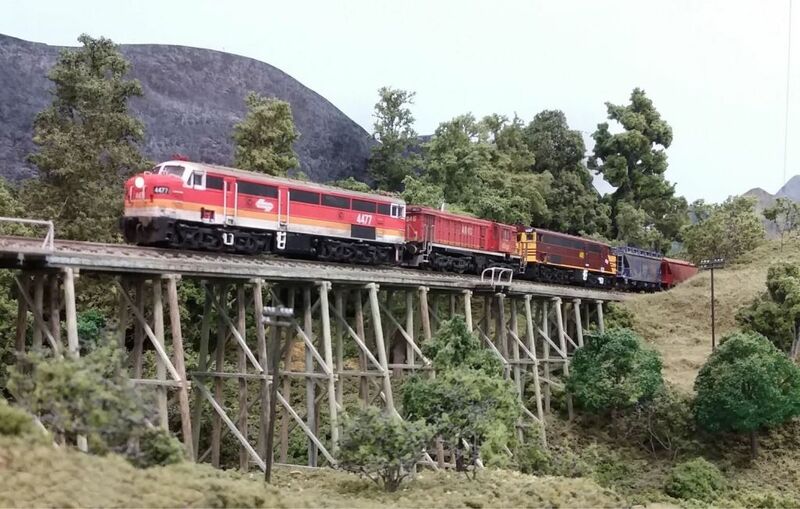 The sound of C502 at notch-8 echoes across the valley as it drags a long freight up the grade from Cann River towards Noorinbee. 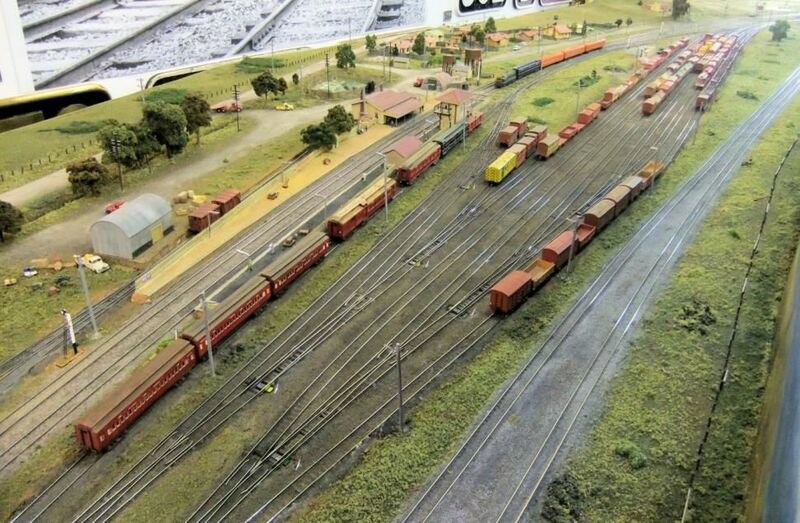 An aerial view of the extensive yards on "Wallan". 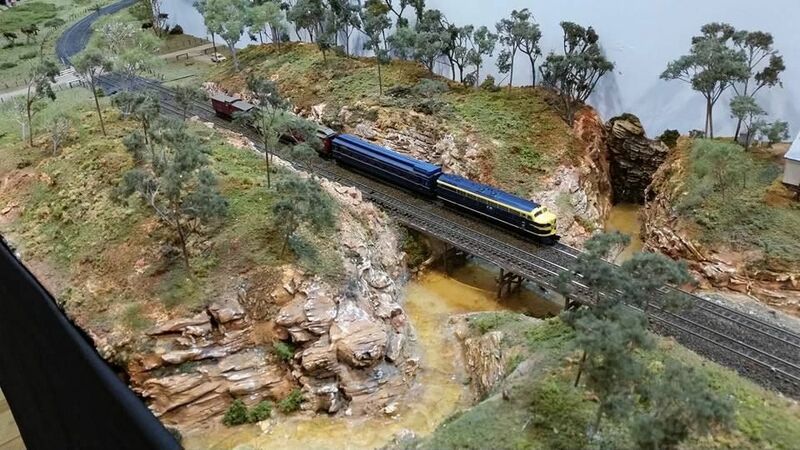 3-car Comeng train on "Cann River". 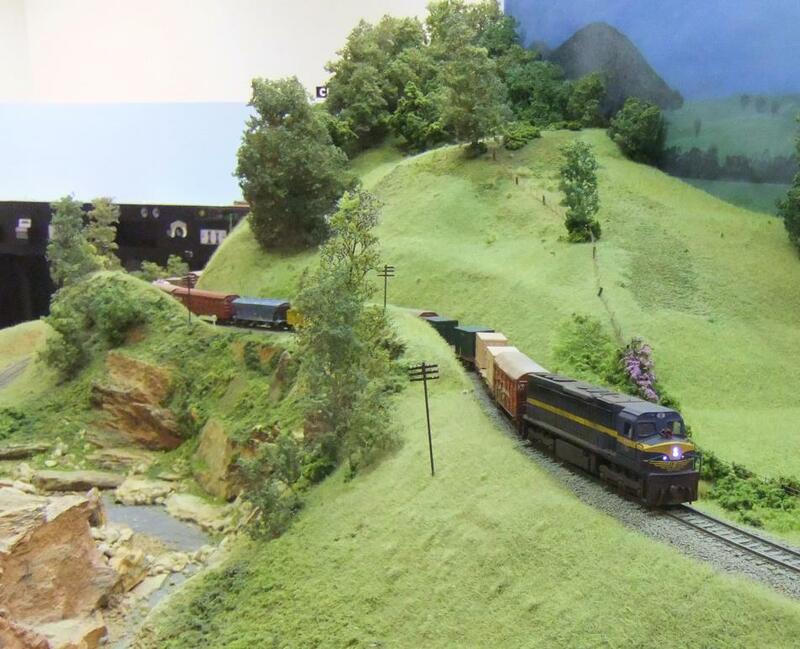 QRN locomotives 6008 and G534 emerge from the hills and head across the high trestle on "Belair". 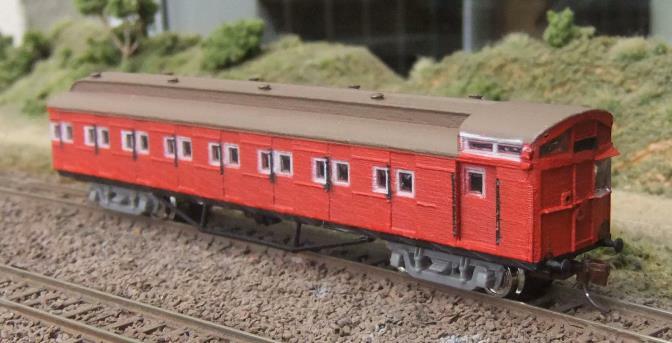 N scale 'Tait' electric multiple unit carriage, awaiting completion of the rest of the train. 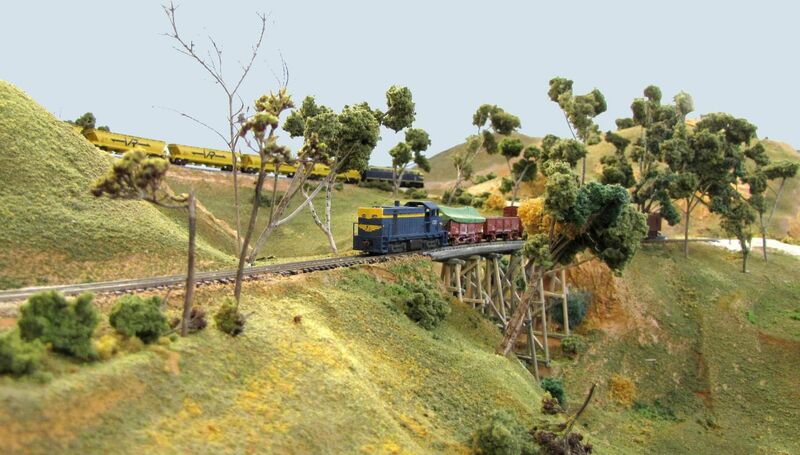 An Aust-N-Rail G class locomotive G512 pulls into Carlsruhe with a train of wooden E cars on “Ky-N-Ton”. The inspiration for this scene came from a fallen tree I had noticed in a paddock beside the Princes Highway in Gippsland. It reminded me of many I had seen whilst travelling throughout Victoria. 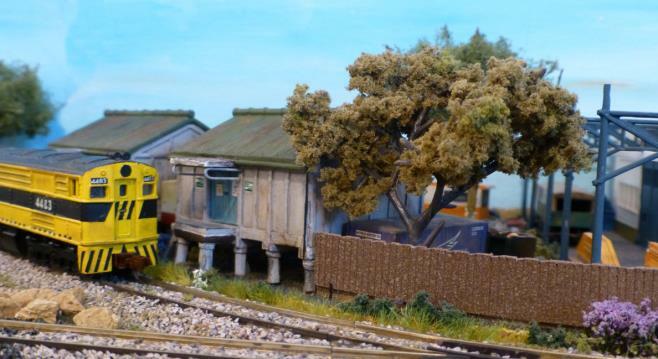 The trunk and branches were made from good old Sedum, which forms the basis for the gum trees on my layout. 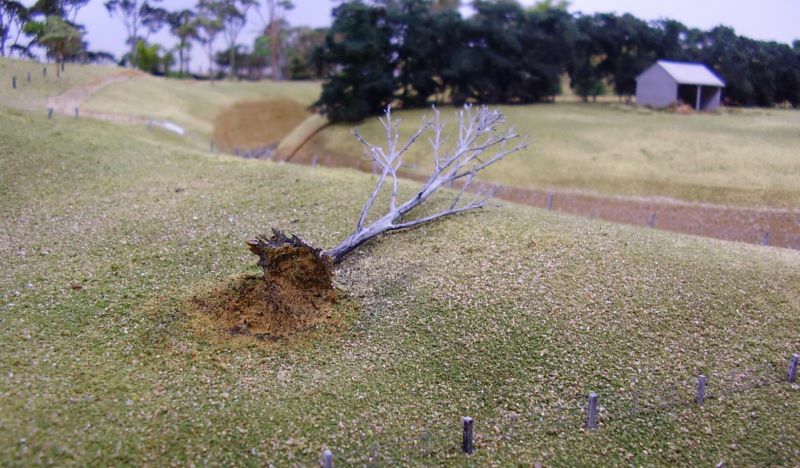 The branches on one side were cut off so the trunk would lie flat on the ground. The root ball is built up from Selleys All-Fix. 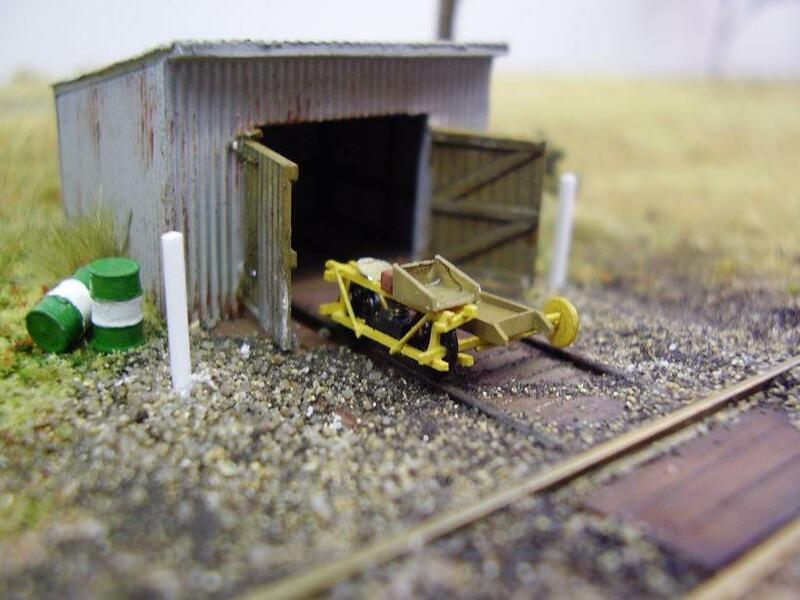 The gangers have everything ready to start inspecting their section of track on "East Blaney". This scene on "Wallan" is actually the same as the scene in real life. 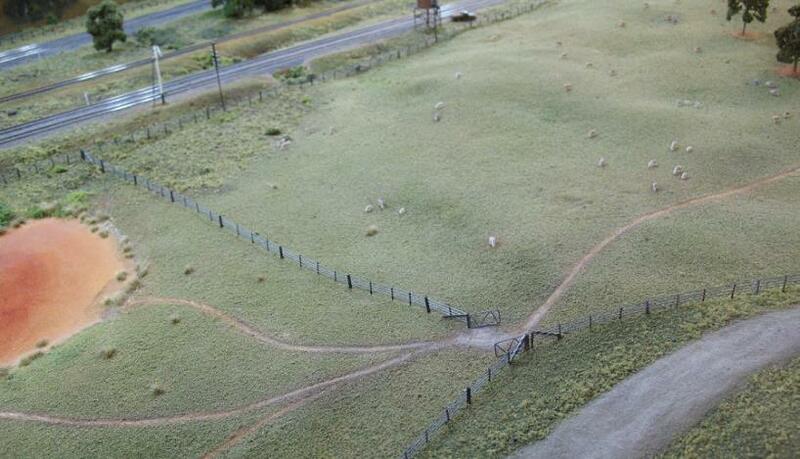 The land forms, tracks, fences, etc, have been copied exactly from an aerial photo—it goes to show just how much information a simple scene can contain. A Wig Wag signal protects the level crossing on "Emu Creek". 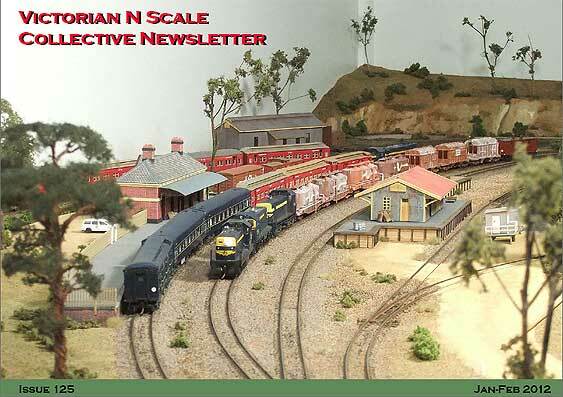 The track side of Noorinbee station on "Cann River", with a flat top T class locomotive arriving into the platform. 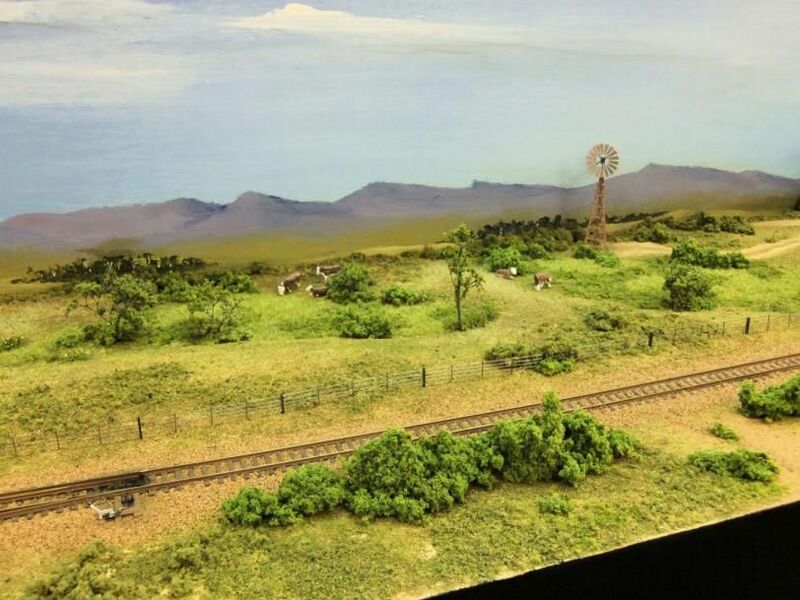 On "Cann River" we see a field of long grass behind Noorinbee station. 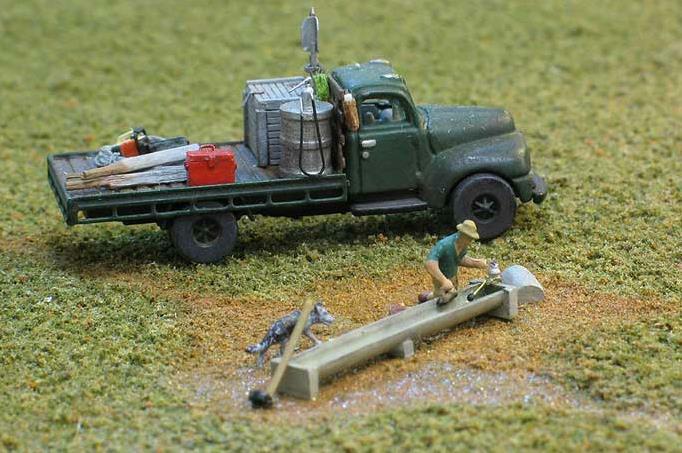 Here a farmer is repairing The water trough for his stock, with Rusty the dog standing guard. 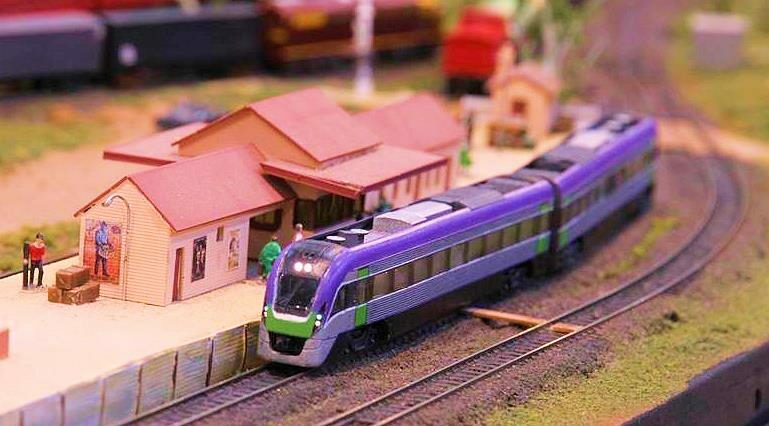 The station precinct on "Newstead" is full of interest due to variable building materials, different fence styles and the presence of the motor vehicles and figures. Trestle bridge on "Cann River" with young boy walking across the stream on a log. 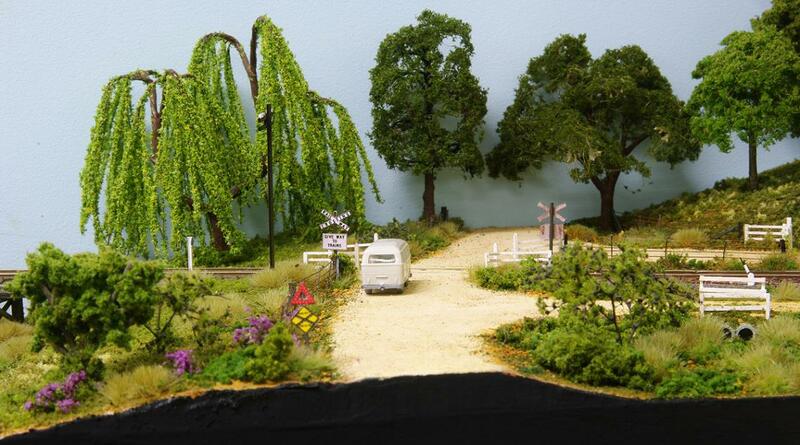 Notice the various types of vegetation. This scene has been heavily worked over. 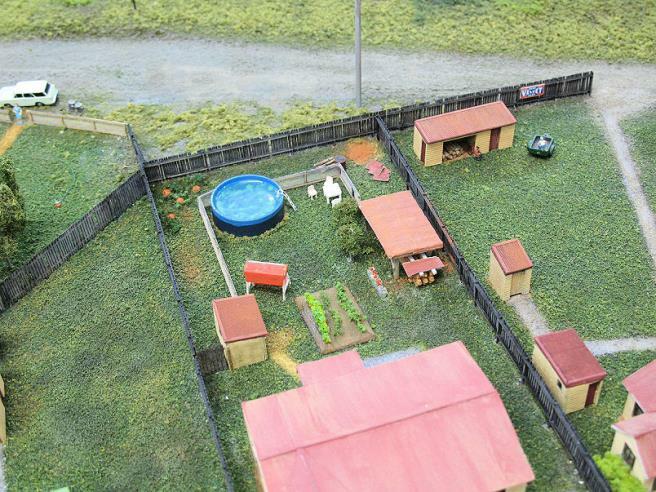 Best attempt at recreating a real backyard on "Wallan" from an aerial photo. This took a while to construct but was worth it to match the prototype. The Kombi van waiting for the train is surrounded by so much detail in this narrow space. 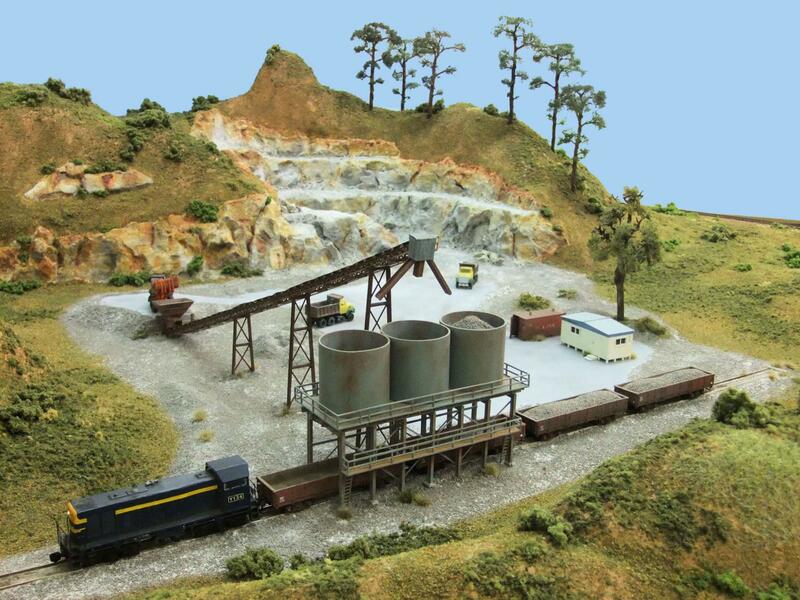 Signs, plants, Way and Works equipment all add to the atmosphere of this scene on "Cann River". Figures really help to animate a scene, as shown here on "Ky-N-Ton". 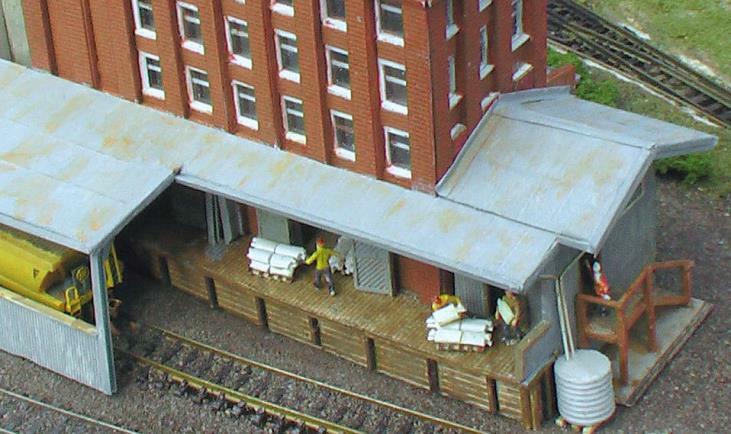 A variety of textural surfaces is in keeping with the character of this industrial area on this T-Trak module. 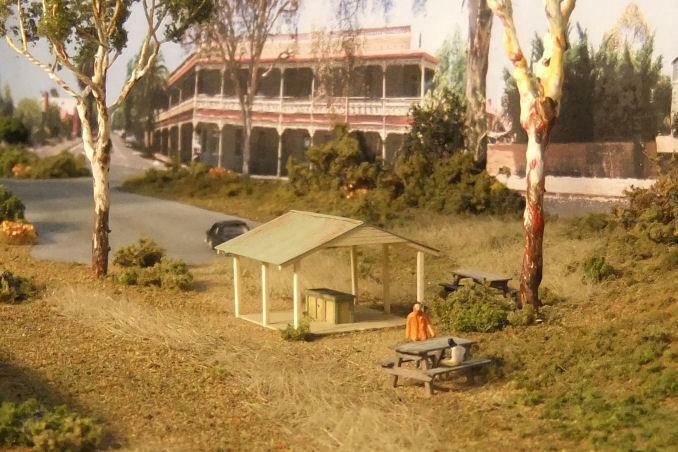 Everyone can relate to this typical Aussie barbeque shelter beneath the gum trees. 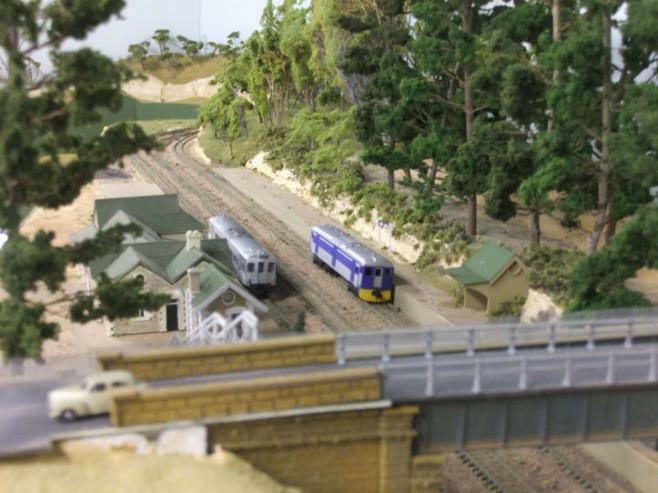 A Bluebird railcar pauses beneath the stand of tall pine trees beside Mt Lofty station on the layout "Belair". 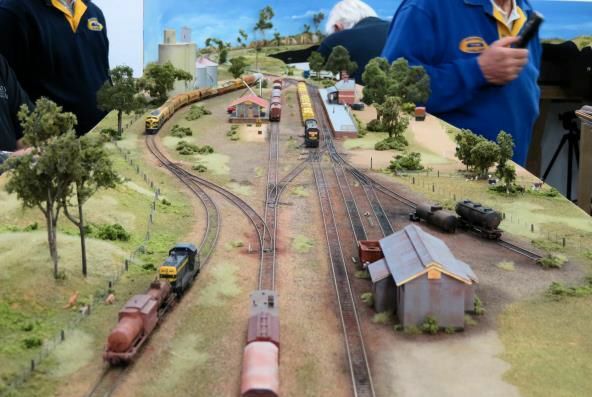 From this view we can see a very busy scene is playing out at Emu Creek. 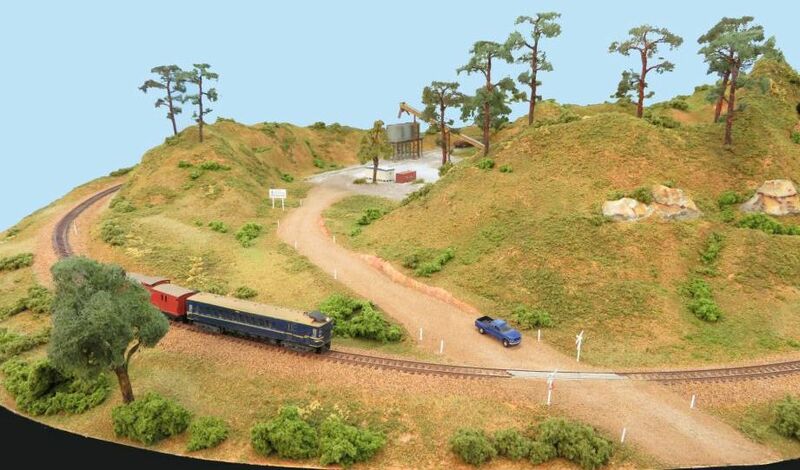 The local pass is waiting a road to clear as the heavy laden cement train from Geelong is needed for more construction work along the line. It is being hauled by a T and 2 Y class locos as most of the mainline power is off on other duties so a lash up was needed to haul the train. 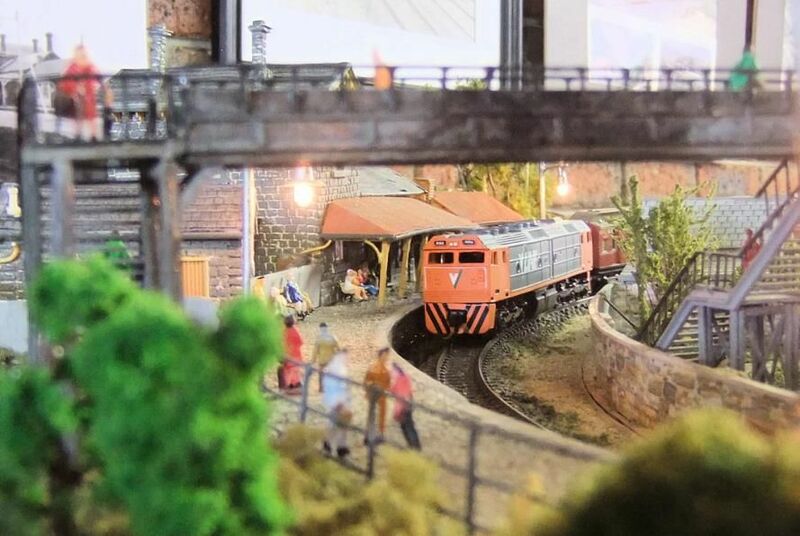 All 3 locos have been scratch built over the years. 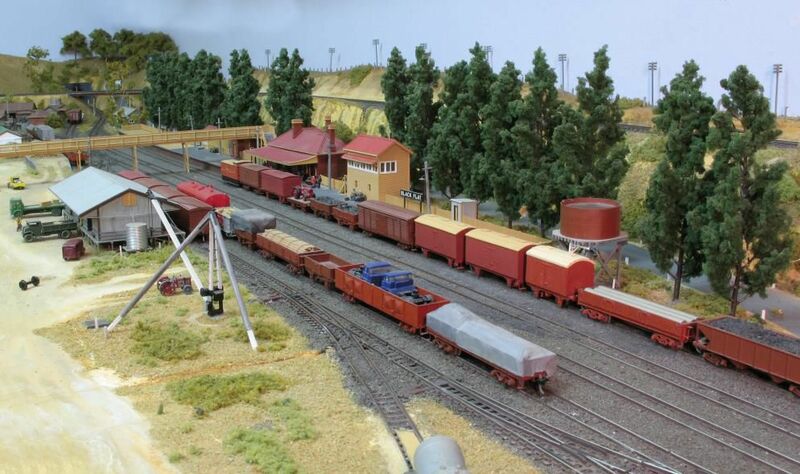 It’s past the morning peak and Wallan’s yard is a hive of activity with an early model T class making up the rake of wagons destined for the Heathcote line and Melbourne yards. 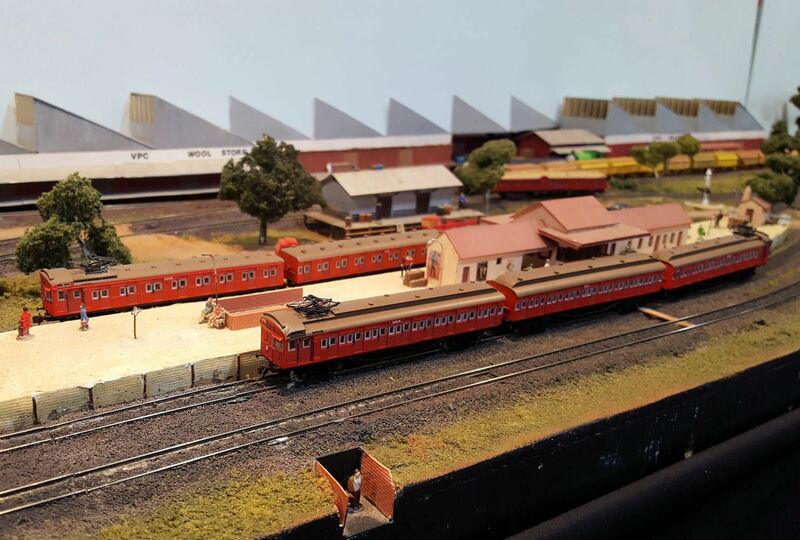 The multi-unit F and W class are awaiting their next call of duty as an Up Derm with ‘C’ van pulls into the platform for the waiting passengers.